A Decade After Flood's Devastation, Love Keeps New Orleans Afloat New Orleans lost much since Hurricane Katrina, and the failed levees that flooded the city. But Gwen Thompkins says the passions that survived the flood kept her city alive too. Paul and Lakeya Mazant met in 2007, during Mardi Gras, as New Orleans was reeling from the flooding after Hurricane Katrina. The couple — pictured with their son Paul, 1, and daughter Logan, 5 — say they couldn't imagine falling in love with someone who hadn't experienced the storm. There are a lot of stories to tell about New Orleans. There are uplifting stories about new houses, new shops and gigantic drainage projects. There are melancholy stories about everything residents lost in Hurricane Katrina, about all that can never be recovered. There are stories about all that remains to be done, 10 years after the hurricane and the levee failures. And, throughout it all, there are love stories. Lakeya Taylor was walking along Orleans Avenue in downtown New Orleans during Mardi Gras in 2007, when she bumped into a handsome young man she'd seen around but had never quite met. Paul Mazant was walking along Orleans Avenue during Mardi Gras in 2007, when he ran into a fetching young woman he'd seen around but had never quite met. Mazant asked Taylor to lunch. 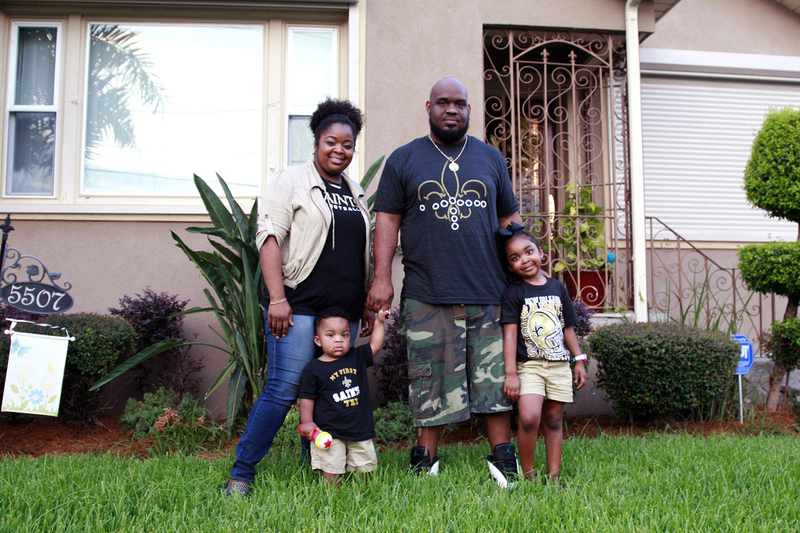 Eight years later, we're sitting in her mother's living room in Gentilly, La., talking about marriage, their sweet children — and why Hurricane Katrina, and the worst series of levee failures in U.S. history, proved the ultimate matchmaker. "It's something to tell our kids, because till this day, we still go walk for Mardi Gras Day in them same spots," she says. "Eight years later, we're on that street ... and we say, 'Mom and Dad met on Orleans. This is where we met, in our city that we love, that we believe in.' "
But in 2007, two years after the flood, Orleans Avenue was anything but cute. The trees were bald. The grass was dead. Almost nobody lived there. "The Lafitte housing project was closed. You just had a lot of empty, empty homes. A lot of emptiness altogether," Paul Mazant says. "But it was still Mardi Gras." Lakeya and Paul Mazant may have sparked that day because they were both in a wretched place, emotionally and geographically. Katrina and a reported 53 breaches in the city's levee system had ruined their homes — and their plans for the future. Lakeya was supposed to be a geriatric nurse. Paul was supposed to rise up the ranks of Lockheed Martin as an electrical engineer. But when more than 1,400 of your neighbors are dead, when your parents are homeless, when the nursing school has shut down and work at Lockheed Martin is on hold, you put your dreams away. "For me, soon as the month of August hit, I replay the whole situation," Paul Mazant says. "That's why it's so easy to tell it." The Mazants rallied. She's now a buyer for Chevron Oronite, which sells additives for gasoline and other kinds of fuel. And he's a project manager for Entergy, which provides electric power to the Gulf South. But they've been watermarked. Neither can imagine going through life with someone who stayed dry in 2005. "You can't experience my stories. You don't understand where I've been and where I've come from," Lakeya says. "You don't know what it's like to grow up before the storm," Paul says. "Right. But if you are from New Orleans, we kind of grew up the same type of way. I'm from where he's from," his wife says. "And to meet right after the storm — dating, married. I know what steps he took because I walked those same steps." Want to hear a love story? Nearly every Saturday night in Marigny, just outside the French Quarter, a crowd gathers on Frenchmen Street to hear John Boutte sing. They've been coming to the d.b.a. club for 15 years. And Boutte's may be the only live music show in town where the audience is this quiet, respectful — kind of like church. "They definitely give me a whole lot of love," Boutte says. "Actually, sometimes it's embarrassing. I'm like, 'You guys really don't know who I am. If you did, you wouldn't like me too much.' 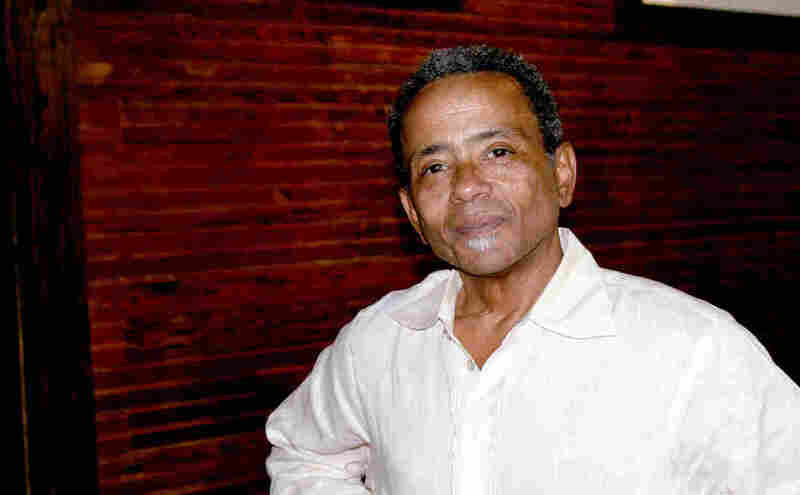 "
When John Boutte sings at the d.b.a club, the audience quiets down and listens. He's one of New Orleans' most celebrated truth-tellers. And he owes his career, in some ways, to the horrific levee failure of 2005. Michael Garran, a manager at the club, has watched Boutte's audience balloon ever since the flood. "In addition to being extremely talented, he is brutally honest and he doesn't put on airs," Garran says. "And he doesn't really kowtow to anyone. A lot of people respect that." The levee failures — as horrific as they were — made Boutte's career. He emerged as one of the city's most likable truth-tellers. In the early days, Boutte's set list included encouraging numbers like the American Songbook classic "Pick Yourself Up" — "take a deep breath — and start all over again ... "
But he also mocked former FEMA chief Michael Brown and former president George W. Bush in song. "I did some angry songs, like Stevie Wonder's 'You Haven't Done Nothin',' " Boutte says. He quotes the lyrics: " 'We are amazed but not amused by all the things you say that you do.' That's how I felt." Boutte lost most of his possessions in the floodwater, but fortune smiled when one of his original compositions became the theme song to the HBO series Treme. At 56 years old, he's now a first-time homeowner. Boutte calls these past 10 years the "best and worst" of his life. This weekend, after a summer hiatus, he's scheduled to return to his audience on Frenchman Street. Then and only then will Boutte know what kinds of songs to sing. "Then ... when I'm feeling good I want to sing 'Back in Your Own Back Yard' — 'A bird with feathers of blue is waiting for you back in your own back yard.' You don't have to go looking anywhere else. This is your place — you can find it here, if you help make it here." The house next to mine in Pontchartrain Park has been gutted and empty for 10 fallow years — until someone recently bought it. And every day for more than a week, the new owners have dispatched a workman to repair the interior. He's from Mississippi, and — truth be told — I can't understand what he says most of the time. But Willie Blackmore loves to work. He's been doing jobs like this for 10 years, he says — "ever since 'Trina." He says the hurricane gave him work. "A lot of work." I'm crazy about him. Or, more specifically, I admire what he's doing next door. By my count, three kinds of love are keeping New Orleans afloat: love of family, love of culture and love of work. Real recovery happens where most people don't notice — on a lunch date, singing along to a headliner in a club, working 12 days in a row to make sure somebody's house gets fixed the right way. That's what makes being here exciting. Not yesterday. Not tomorrow. But right now. Gwen Thompkins hosts the program Music Inside Out on member station WWNO in New Orleans.